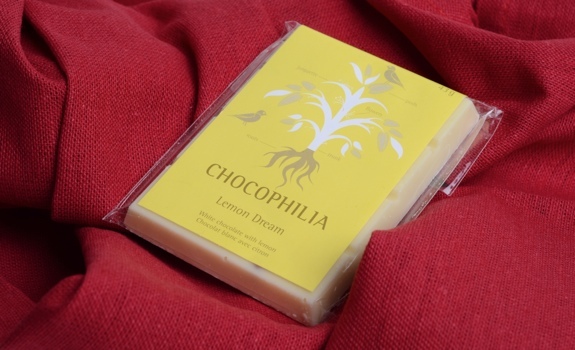 Kerstin’s Lemon Dream Chocophilia bar, for those who love white chocolate and lemon. White chocolate is a polarizing foodstuff. Some call it a pretender to the chocolate name, something quite unlike either milk or dark chocolate and thus undeserving of being lumped in with “real” chocolate. Others, me included, see it as a delicious variant, something to be celebrated and occasionally savoured. It’s sweet, it’s creamy, and I can’t eat too much of it without wearing out my palate. But in moderation? Bliss. I’ve found that white chocolate pairs nicely with other flavours. I add white chocolate melting wafers to my raspberry (or blackberry, if available) scone recipe, and it adds something special to the mix. I’ve tried the same scone recipe with milk chocolate, but it just doesn’t work. There’s something pleasantly neutral about white chocolate that gives it extra versatility. While chocolate snobs tend to scoff at white chocolate, I was happy to see that premium Edmonton chocolatier Kerstin’s Chocolates has created a curious white chocolate product: the Lemon Dream Chocophilia bar. Like the rest of the Chocophilia line, the Lemon Dream bar is handmade in Edmonton. It combines quality white chocolate with lemon oil and pieces of candied lemon. The smell is instantly lemony. The taste is equally dripping with lemon flavour, which rises above the almost cloyingly sweet, creamy white chocolate base. Buried in the lemon-oil-infused white chocolate are good sized chunks of candied lemon. Think marmalade, not lemon meringue. The taste is amazing, but it’s intense enough that it’s best eaten over a couple of sessions. Or, better yet, shared with a friend. Especially if that friend happens to be me. Hint, hint. Cost: $3.99 at the Sobeys in downtown Edmonton. Value for cash money: Not cheap, but good for a premium handmade chocolate bar. Availability: Edmonton, certainly. But you can buy them online through the Kerstin’s Chocophilia website. Nutrition? : 247 calories per 43 gram bar. It’s mostly white chocolate, so lots of fat (especially saturated), some sugar, and wee bit of protein. It contains some whole milk, so that explains the moderate hit of calcium. Eat local, eh? : A wonderful local Edmonton product. The verdict: For about the same nutritional damage as a regular chocolate bar (and about 3 to 4 times the price), it’s the kind of sweet treat I’d grab when I feel like spoiling myself. It’s a premium product, so the extra cost doesn’t bother me. Live a little, and pinch pennies elsewhere.